For the longest time I didn't read anything because I felt like I didn't have time. But now I think it’s because I was reading the wrong books. Because there are some books you could be reading that will teach you so much about boosting your online brand. I’m going to go over a few books today that will not only make you feel so motivated while you’re reading them; but will also help you embrace the struggles and hurdles you come across when running your online presence in order to get you to your next breakthrough. So let’s get ready to boost your brand and these are the 3 books I think are going to help you do just that. First I’m going to mention a book that I’m still currently reading and that is Crushing It! by Gary Vaynerchuk. The reason I love this book and this is in no offence to Gary himself (sorry pal) - but it’s got so many other people’s stories in there and that’s what makes the book what it is. 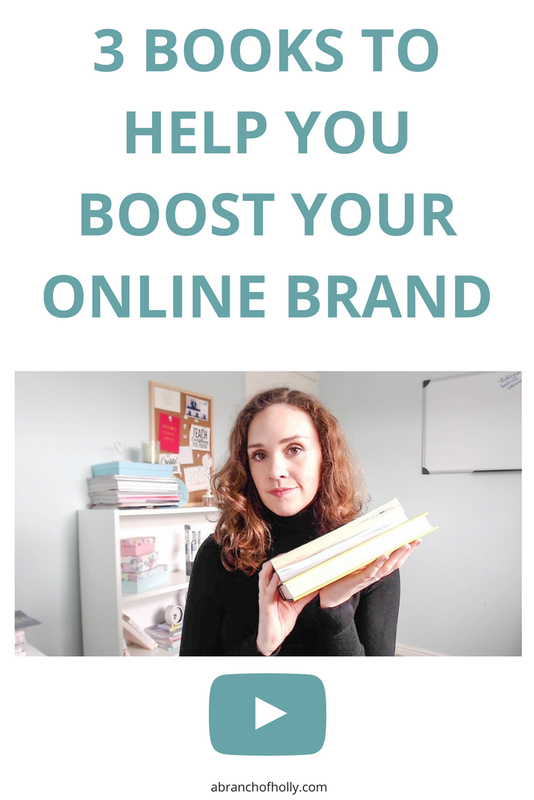 So a couple of reasons to read this when it comes to boosting your online brand. And not just boosting your brand but boosting yourself in general. Like I just said, this book is filled with stories from real people who had a dream or a goal, followed it and worked hard to make that happen and are still doing that right now. The stories of these people are based on what they learnt from reading Gary’s other book Crush It! and how they implemented what they learnt. I find that there’s no other way for me to feel motivated and want to really make a boost in my life and in my online presence than by reading other people’s stories. It makes you realise that what was possible for someone else could also be possible for you too. Knowing that someone achieved their goal and got to where they wanted to be by going after breakthrough after breakthrough is so motivating. It will make you want to do something right now. That’s what makes a great book and that’s actually what all the books in this post have in common. It’s like you want to finish a book because it’s so good but then you also don’t want it to end because oh my gosh my to do list is HUGE. But that’s what you want. The second book I suggest you read to help you boost your online brand is Make It Happen by Lara Casey. I was being recommended this book SO much and then a couple of years ago my mum got it me for my birthday. And honestly this book has changed my whole outlook on life. What I love about this book is that you don’t just read it. Lara encourages you to write down your thoughts and there’s even space in the book to do so. It talks about each of us having our own purpose, and how we actually need to face our fears and go through some struggles to find out where we actually want to be. She shares her own journey and life experiences, some of which are really difficult to read, because she’s just been through some BIG struggles. But something I know that makes people unsure about whether to read this book is because Lara is a very religious person, she believes heavily in her faith. So she talks a lot about her relationship with God throughout all of this. But I find that SO spiritual and actually refreshing. You know, if you’re stuck somewhere and you don’t know what to do, you can just say quietly in your head, God, please show me a sign or is this right for me? But definitely take notes when reading this book and write within the book too, but just give it your full attention. And while it is a personal book about life, you can also really relate it to building your online presence if that’s a big part of your life. It made me feel so confident with my ability that I just wanted to go and make an impact with people right away. You’re going to start feeling so excited about your life when you read Lara’s words that you’ll feel like anything is possible. And the third book I recommend you take a look at in order to boost your online brand is Vlog Like A Boss from Amy Landino. I absolutely flew through this book. I watch Amy’s YouTube videos and listen to her podcast so when I really started getting into YouTube it just made sense for me to buy her book. And the whole time I was reading it I had a pink pen that was attached to my hand and I was just underlining everything and making notes.. This was also the first book I actually made time for myself to read since I took my business full-time which was a really big deal for me. I’m so glad I read this book. If any of these books spoke to me the most, made me feel super super pumped and actually you know, explained strategies in a simple and actionable way - it would be this book. You’d think that with it being called Vlog Like A Boss Amy would just talk all about vlogging, but she doesn’t. She talks about fears, the comparison trap, accepting yourself and finding your message as well as everything that comes with vlogging. I mean the value that is in here is just insane, I’m so glad she wrote this book. So if you’re thinking about starting on YouTube or upping your game, I’d definitely recommend getting this book, it’s just.T he way Amy writes is so relatable and I didn’t want it to end, I wanted her to be with me teaching me and talking to me just forever. Three inspiring people. Three amazing books. Three books that have definitely helped me make a change with my life and my online presence. I want to know, what do you think is a great book that everyone should know about to boost their online presence? Share that in the comments below. Remember to read some books that make you feel like a boss so you can get one step closer to a breakthrough.